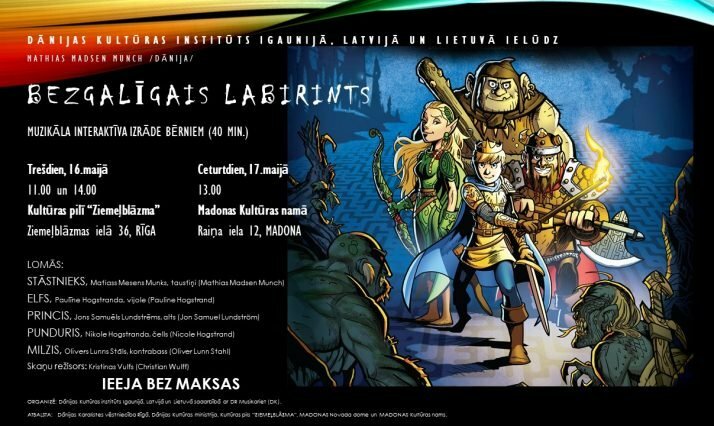 The interactive concert, created by composer Mathias Madsen Munch, will be performed on 16. and 17.May at the Cultural Palace “Ziemeļblāzma” in Riga and the Culture House of Madona municipality. The Endless Labyrinth is a captivating and exciting concert based on role-playing and adventure games – an interactive musical adventure for children, performed by string ensemble and electronics. The Giant, the Dwarf, the Elf and the brave Prince of Philharmonia are trying to escape from the Forest of Molduria, which is controlled by the evil Wizard. The audience will ultimately decide how the characters act and hopefully help them find a way out of the Labyrinth. The performers are: Mathias Madsen Munch, keytar, Pauline Hogstrand, viola, Jens Elfving, violin, Nicole Hogstrand, cello, Oliver Lunn Stahl, double bass. Technician: Christian Wulff (sound design). On 17. May Mathias Madsen Munch gives a workshop at Madona Culture House for children in “Sound design – cinematic stories through sound.” The participants for the workshop will be introduced to the sound designer’s world and will design a soundtrack for a Danish animation movie in real-time, using both music and sound effects. The Endless Labyrinth is presented by DR Musikariet, a framework of various musical activities for children and youth, organized by the Danish Broadcasting Corporation’s Koncerthuset (Concert House). The events are organized by Danish Cultural Institute in Estonia, Latvia and Lithuania with the support of Danish Ministry of Culture, The Royal Danish Embassy in Riga in cooperation with Culture Palace “Ziemeļblāzma” and Madona Culture House. It is a part of a cultural programme “Latvia 100 years – the Danish Input” created as a contribution to Latvia Centenary celebration in 2018.